Warner Bros. had a financially successful year in 2016, even if it was a bit rocky in some ways critically speaking. Most notably, the DC Extended Universe movies, both Batman V. Superman: Dawn of Justice and Suicide Squad, were trashed by critics on arrival. One of the biggest releases for Warner Bros. last year was the Harry Potter spin-off, Fantastic Beasts and Where to Find Them, and it is now very safe to say the movie is a big success. Not only was it well-received by critics and fans, but as of today, the movie has officially crossed the $800 million mark at the worldwide box office. According to Box Office Mojo, Fantastic Beasts and Where to Find Them had a production budget of $180 million. While that is certainly high, a take of $800 million at the box office makes the first Harry Potter spinoff movie quite the successful endeavour for Warner Bros. Sue Kroll, President of worldwide marketing and distribution, had this to say in a statement following the news that Fantastic Beasts had crossed the milestone. "Returning to the wizarding world in 'Fantastic Beasts' was a labor of love for all of us, and it has been a privilege to watch audiences around the world embrace a new cast of characters in this world created by the incomparable J.K. Rowling. This is an extraordinary milestone for the first film in our new franchise and speaks to the remarkable talents of the cast and filmmakers who worked so hard to bring it to the screen. Congratulations to them, as well as to the Warner Bros. marketing and distribution teams on this great success." Even though Fantastic Beasts and Where to Find Them isn't directly connected to the main Harry Potter storyline, it is very much an authentic part of the wizarding world. Author J.K. Rowling wrote the screenplay for the movie herself and it was based on the fictional textbook authored by the movie's protagonist, Newt Scamander, who was played by Oscar-winner Eddie Redmayne. 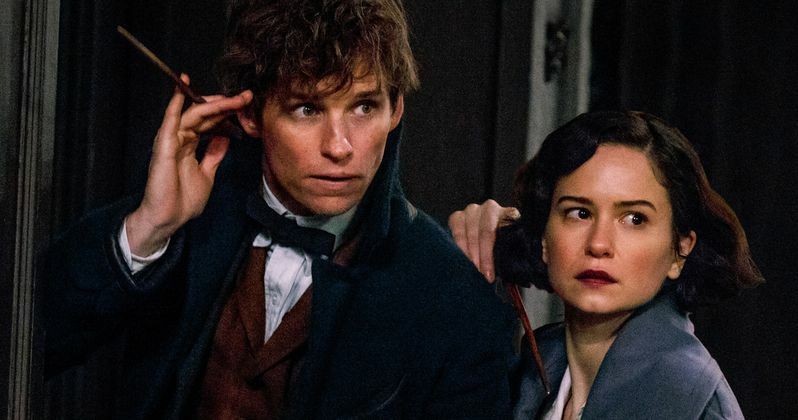 Warner Bros. is already moving ahead with Fantastic Beasts and Where to Find Them 2, which was given the greenlight months before the first movie even hit theaters. Luckily, it seems like the studio wasn't jumping the gun on that decision since audiences are clearly eager for more Harry Potter related stuff. In terms of how Fantastic Beasts and Where to Find Them stacks up against the other Harry Potter movies at the box office, it isn't bad considering that the words "Harry Potter" don't appear anywhere in the title. The lowest grossing movie in the Harry Potter franchise was Harry Potter and the Prisoner of Azkaban, which made $796 million worldwide. Somewhat ironically, many consider that movie to be among the best in the franchise. In any case, that puts Fantastic Beasts just ahead of that movie, meaning that it was at least able to stay on par with what that series was able to do in terms of box office. That is no doubt very encouraging for Warner Bros. moving forward. We don't know a ton about Fantastic Beasts and Where to Find Them 2, but we do know that Johnny Depp is going to play the famed wizard Grindelwald, which *spoilers* was revealed at the end of the first movie. Director David Yates is also returning to the director's chair after helming the final four Harry Potter movies and the first Fantastic Beasts. Warner Bros. has Fantastic Beasts and Where to Find Them 2 scheduled to hit theaters on November 16, 2018. Assuming they can deliver another well-liked movie, Warner Bros. has every reason to suspect the sequel can do just as well at the box office, which means they will probably move ahead with the five movie plan that J.K. Rowling has outlined. So don't worry Potterheads, there is plenty more wizarding action on the way in the years to come.